Benicar HCTZ is used to treat high blood pressure. 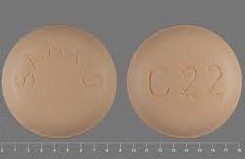 It is a combination angiotensin II receptor blocker and diuretic. The angiotensin II receptor blocker works by relaxing the blood vessels and the diuretic helps the kidneys to eliminate fluid and sodium from the body. Benicar HCTZ should not be used by anyone that is pregnant, has severe kidney problems, or if you are taking dofetilide or ketanserin. Benicar HCTZ can cause injury or even death to a developing fetus when used after the third month of pregnancy. Benicar HCTZ does not cause many side effects except for dizziness and nausea. However if you get an allergic reaction to the medication you should contact your physician as soon as possible. Severe allergic reactions include (rash; hives; difficulty breathing; tightness in the chest; swelling of the mouth, face, lips, or tongue); chest pain; confusion; decrease in sexual ability; decreased urination; depression; drowsiness; fainting; fast or irregular heartbeat; fever, chills, or persistent sore throat; hoarseness; muscle pain, tenderness, or cramps; red, swollen, blistered, or peeling skin; restlessness; seizures; severe or persistent dry mouth; shortness of breath; swelling of the arms or legs; unusual bruising or bleeding; unusual thirst, tiredness, or weakness; vomiting; yellowing of the skin or eyes.